This hoard of 47,898 third century radiates is one of the largest ever found in Britain. It was discovered by a farmworker in December 1985 in the parish of Normanby, about twelve miles north of Lincoln. The coins were largely struck between AD253 and 287 and, because of their low silver content and the laws in force at the time, were not declared treasure trove. Therefore, after 18 months cleaning and study by the British Museum, they were returned to the finder and landowner. The hoard was subsequently purchased en masse by the London coin and antiquity dealer, C.J.Martin. Both the British Museum and the Ashmolean Museum purchased groups for their collections. The BM acquiring only 550 of the 1775 it had targeted. The rest were offered for sale or dispersed through the trade, largely outside of the UK. The initial catalogue illustrated above listed over 500 coins including a selection of rare types and mint errors. The pot that originally contained the hoard was acquired by the Lincoln Museum. 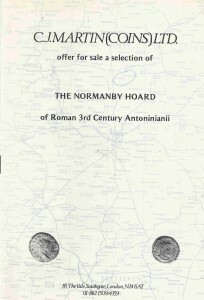 The Normanby Hoard and other Roman coin hoards, Coin Hoards from Roman Britain Volume VIII, ed. Roger Bland and Andrew Burnett, British Museum 1988, pages 114-215, plates 7-39. 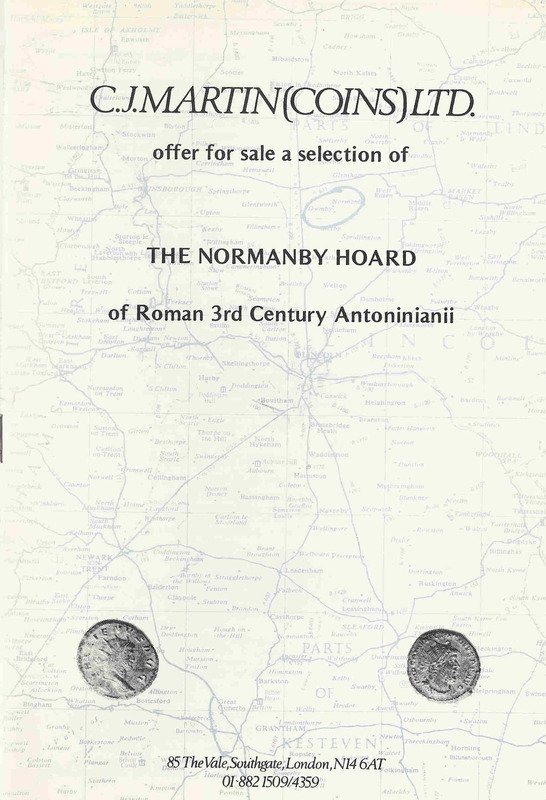 The Normanby Hoard of Roman 3rd Century Antoninianii, C.J.Martin (Coins) Ltd., 1987, 16 page booklet including 1 plate.